I love that so many centuries-old churches in England are still commissioning art—inviting contemporary visual styles into their worship space to stand alongside medieval pillars, frescoes, and window glass as expressions of the times that change and the Truth that does not. 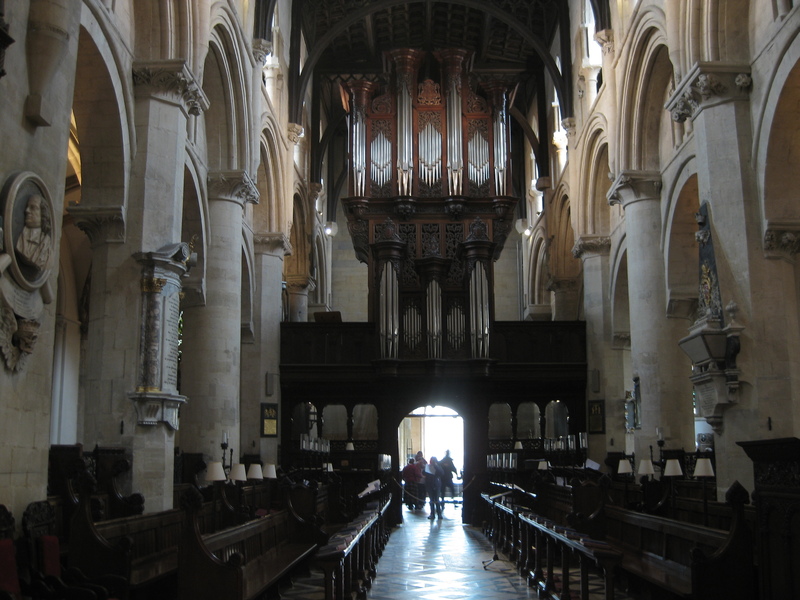 Christ Church Cathedral in Oxford is one such example, as two twenty-first-century wood pieces are on permanent display at the head of its twelfth-century north aisle. “Christ Church” is the name of one of Oxford University’s thirty-eight colleges. 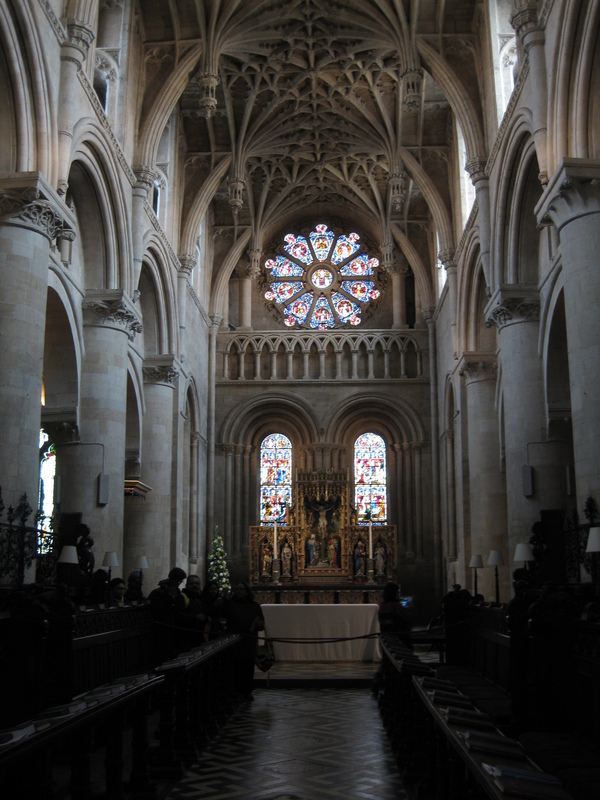 The church on its campus serves not only as the college’s chapel but also as the cathedral church of the diocese of Oxford—meaning that a bishop is seated there. As I walked down the nave, I was drawn to my left, where I saw the following two pairs of modern works, arranged in conversation with each other. These two sculptures—one of Mary, and one of the baby Jesus—form a nativity scene that’s stripped of all other spectators. It’s just a mother alone with her child, sharing an intimate, blessed bond. Mary’s eyes look lovingly downward at the sleeping child, her hands folded in thanks to God for such a gift. For Jesus’s crib, Phillips used a quern, an instrument used for producing flour. 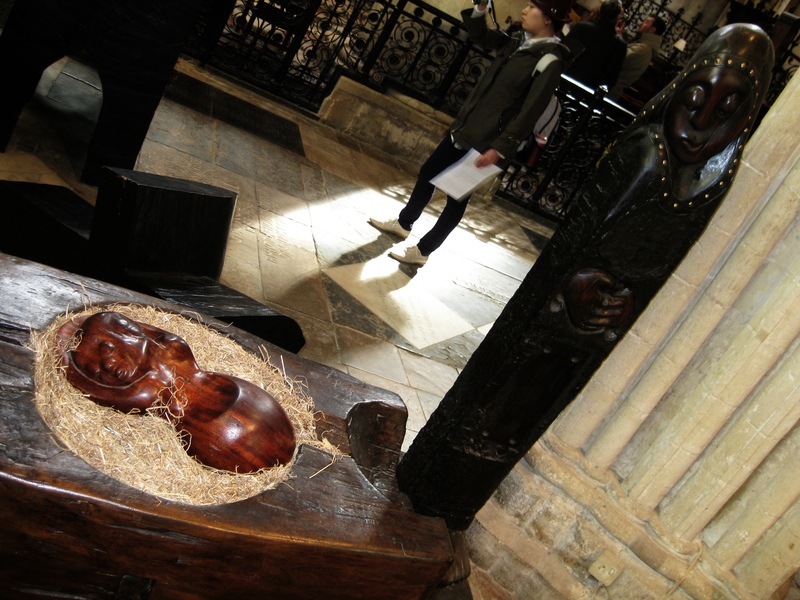 Jesus lies in the cavity where the grain would be placed for grinding, alluding to the crucifixion, in which Jesus was crushed to death but after which he became the Bread of Life that we enjoy today. The two figures are carved out of Jarrah wood, which comes from a type of eucalyptus tree native to Australia. They definitely have a primitive look to them, the style and form seeming to bear an African influence. Rita Phillips studied at the Slade School of Fine Art in London. She then went on to study at The Frink School of Figurative Sculpture from 1999 to 2001, and to teach there from 2001 to 2005. My attempt to contact her has been unsuccessful. The only other work of hers that I could find online is her Pietà in the Harold Martin Botanic Garden at the University of Leicester, in which Mary’s pose from this Madonna and Child is deliberately copied. Rita Phillips, Tsamaya Sentle (Setswana for “Go Gently with Life”), 2002. Jarrah wood, 208 cm tall. Harold Martin Botanic Garden, University of Leicester, England. The “Pietà” or “Madonna and Child” are holy images which stir elemental emotions. It is a Christian icon which draws part of its strength from its pagan ancestors, and which has inspired some of the world’s greatest artists. The “Madonna and Child” are sometimes grave, even sad. The shadow of death is already on them. The desolating strength of the Pietà, the mother holding the sagging body of her adult son, comes from understanding that a circle, which began with the arm curved around the baby, has been completed—the circle, in any culture, of life itself. 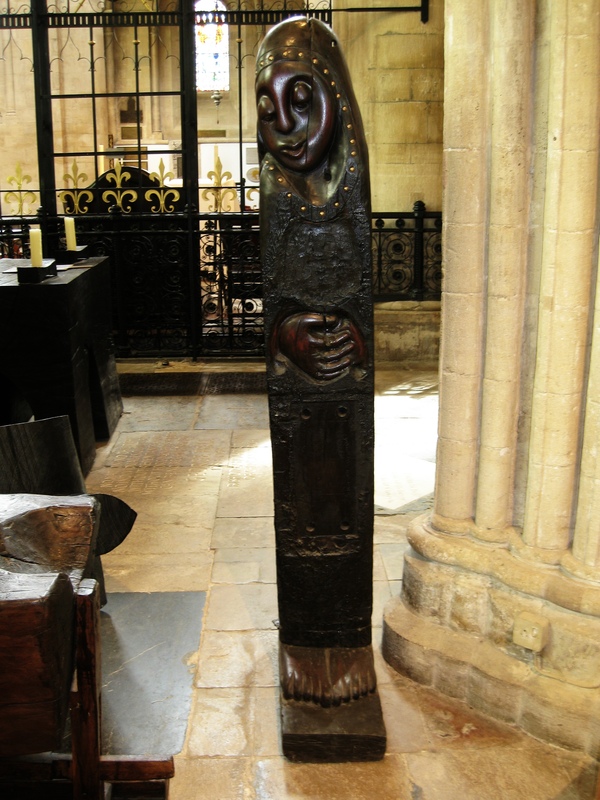 The gaze of the Mary figure in Christ Church Cathedral is one of joy mixed with sorrow. Here she looks down at a manger, where her son lies with eyes closed in sleep, knowing that all too soon, she would be looking down at a funeral bier, where her son would lie dead. Phillips’s work is lovely, and if you know any more about it, I’d be interested to hear. 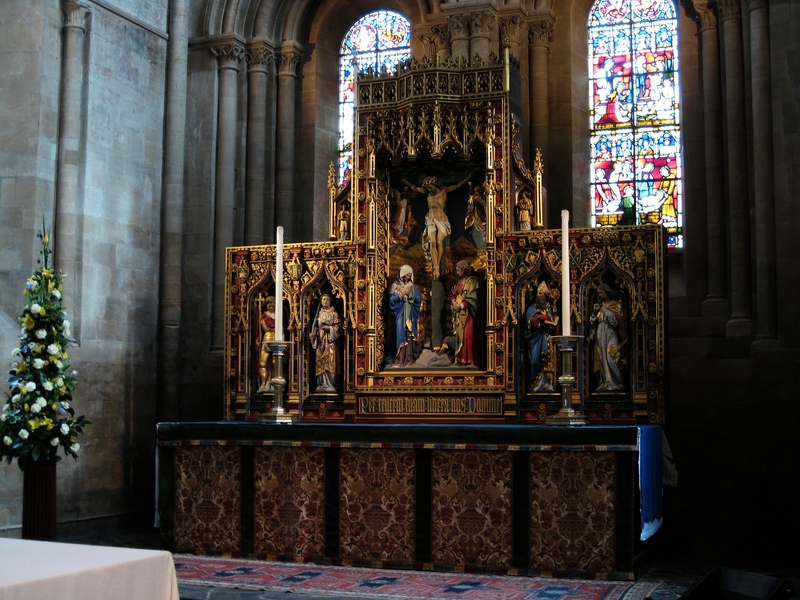 This altar and cross commemorate George Bell (1883-1958), an Englishman who served in several positions during his lifetime, among them Dean of Canterbury, Bishop of Chichester, member of the House of Lords, President of the World Council of Churches, and tutor at Christ Church. But this artwork pays particular homage to the role he played during and after World War II: as a supporter of the anti-Nazi Confessing Church, a critic of England’s wartime policies, and an advocate for post-war reconciliation. Bell was close friends with the German pastor and martyr Dietrich Bonhoeffer, the founding member of the Confessing Church, an international group of Christians who condemned pro-Nazi German Christianity as false and heretical. As such, he helped make known to the European and American public what was really going on in Germany and was active in the campaign to provide aid and asylum to German refugees and conscientious objectors. to condemn the infliction of reprisals, or the bombing of civilian populations, by the military forces of its own nation. It should set itself against the propaganda of lies and hatred. It should be ready to encourage the resumption of friendly relations with the enemy nation. It should set its face against any war of extermination or enslavement, and any measures directly aimed to destroy the morale of a population. After the war ended, Bell took a lead in rebuilding the relationships between German churches and those in other countries, and in calling all people to forgiveness and reconciliation. In a post-war broadcast to Germany in 1945, he stated, “No nation, no church, no individual is guiltless. Without repentance and without forgiveness, there can be no regeneration.” These words form the inscription on the stone tile at the altar’s base, carved by John Neilson. 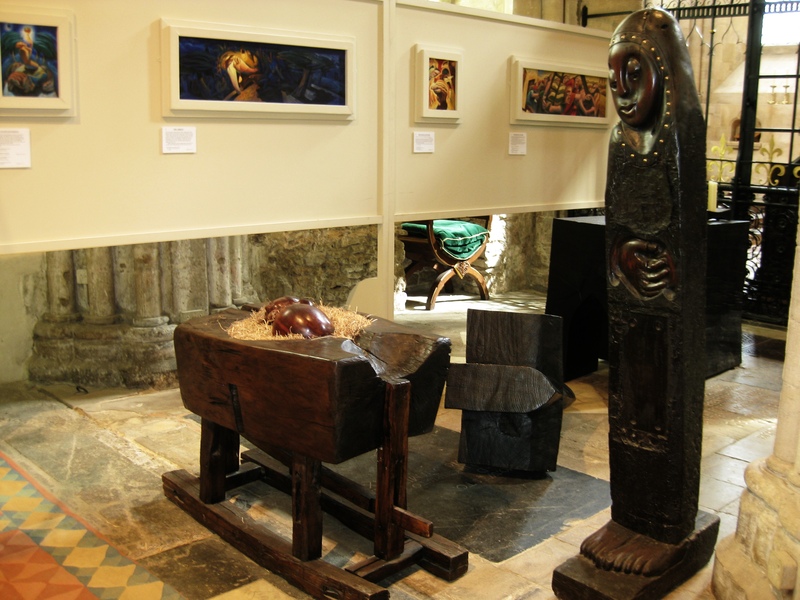 Jim Partridge is the one who created the ACE award-winning altar and cross, from a four-hundred-year-old oak tree from Windsor Great Park. He actually carved the cross out of the base of the altar—to evoke the idea of origin and return, according to the cathedral’s website. (To see a photo of the work in progress, click here.) Given the inscription and the legacy of the altar’s dedicatee, I imagine the pair of carvings to represent the void that was left by the war, a void that begs to be fitted with something. That something is Christ, symbolized here by the cross; it is he who will restore the block of humanity, make us solid again. If Christ forgave his enemies even as they were attacking him, then surely we should forgive our enemies too. And because Christ has gifted us with his very Spirit, such forgiveness is made possible. The color of the wood is black because Partridge scorched it—a reminder of the black days of war and the damage wrought by bombs. 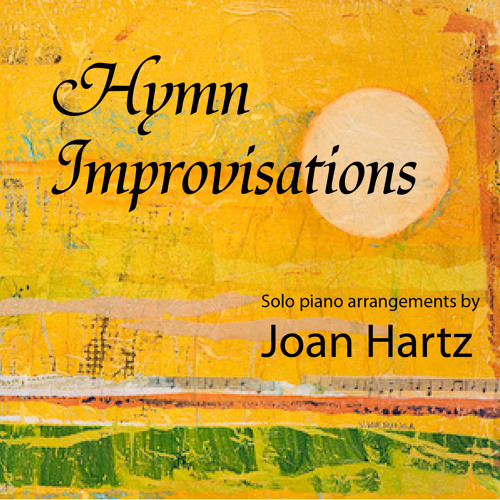 Yet despite the feelings of sorrow it evokes, its message is ultimately one of hope. World War II may have cast a dark shadow over the church, as have other wars since, but Christ is alive and active, rebuilding what man has destroyed. It may seem an odd subject for a piece commissioned to mark the new millennium. Why hark back to an event that has had little impact on today’s generation? I would argue, though, that the subject is perfectly appropriate for the twenty-first century. On this side of eternity, there will always be an enemy. There will always be war and violence and prejudice. There will always be sadness and anger and bitterness and distrust. Some of the dividing lines have shifted since the 1940s, but the universal need for repentance, forgiveness, and regeneration—to use Bell’s words—has not. I appreciate Christ Church Cathedral for honoring the life and work of George Bell. He spoke with conviction against an unjust English government practice, making him very politically unpopular. He was shouted off the House floor when he tried to launch resolutions and was constantly accused of undermining the war effort. For love of his nation, he spoke out against her, just as the Jewish prophets did in Old Testament times. May God give us the courage to follow Bell’s example whenever our governments err. Though Bell didn’t have many supporters in his time, the Church of England (and the Episcopal Church in the USA) now honors him with a feast day on October 3. In addition to being known for his outspokenness and relief efforts during war, he is also famous for his pioneering role in the ecumenical movement. He worked tirelessly in to unify all Christian denominations around a common set of values—and more than that, to incorporate those from other faiths into this unity. It communicates meaningfully with Rita Phillips’s Madonna and Child, which the Visitor’s Officer tells me was installed sometime around 2003. The cross foreshadows Jesus’s death, but also gives his birth meaning. The incarnation and the passion are key phases of the same mission, and here they are shown reinforcing each other. Also, by sharing space, an association is forged—at least in my mind—between Mary and all mothers who have lost children to acts of violence. I already quoted Phillips on the iconographical similarities between the subjects of the Madonna and Child (the baby Jesus in his mother’s arms) and the Pietà (the dead Jesus in his mother’s arms); here we see a cross, like a missile, pointing right toward the new mother, and we know she knows what’s coming. As Simeon prophesied to Mary at Jesus’s dedication in the temple, “A sword will pierce your own soul too” (Luke 2:35). A similar piercing was felt by countless German mothers whose sons and daughters were killed in civilian attacks during the war. So that you get an idea of the space these pieces inhabit, here are a few photos that my husband took from the central aisle. If you’re looking at the first photo, the two pieces I discussed are located in a side chapel just through the farmost arch to the left. 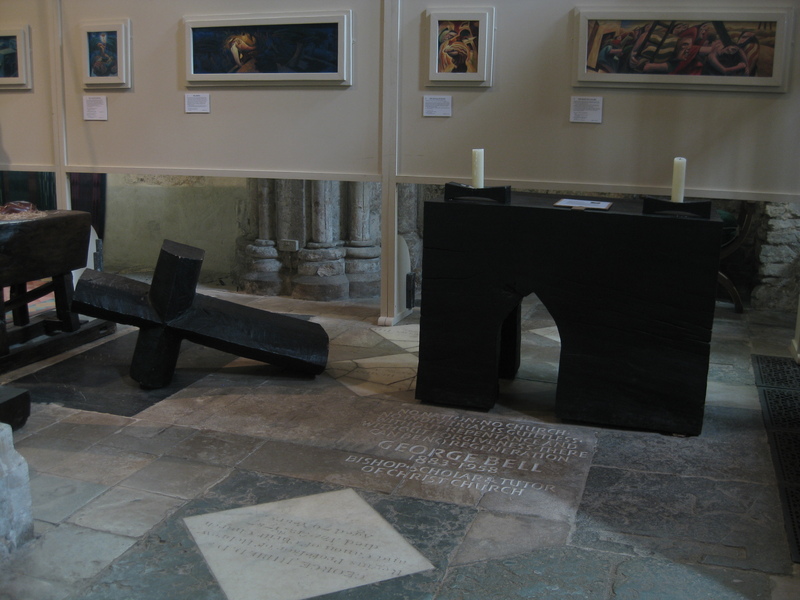 This entry was posted in Western Art and tagged bishop george bell, charred altar in christ church cathedral, christ church cathedral modern art, contemporary christian art in england, jim partridge, john nielson, navity in christ church cathedral, rita phillips art. Bookmark the permalink.